The B.P.R.D. is changing. Abes encounter in Indonesia has brought a new member to the Bureau, and Johann finds himself in possession of a very valuable commodity. But not all the changes are for the better, and the B.P.R.D. will need all of its new resources to handle the sinister forces that have wormed their way into the heart of the Bureaus headquarters, as the line blurs between the hunters of the supernatural and their prey. Written by John Arcudi and Hellboy and B.P.R.D. creator Mike Mignola, and drawn by acclaimed artist Guy Davis, B.P.R.D. 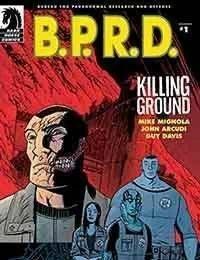 : Killing Ground immediately follows B.P.R.D. : Garden of Souls. **This series will leave the Bureau and its members forever changed!